While the Philippines honors Andres Bonifacio’s birthday last November 30, a different celebration was happening at the Centennial Terminal. It was the inaugural flight of PR118, Philippine Airlines‘ direct service from Manila to Toronto, Canada. Aside from passengers flying to Toronto for business, holiday, or to migrate, passengers of this flight also included PAL executives, members of the media, and of course, the ubiquitous bloggers. That’s us. 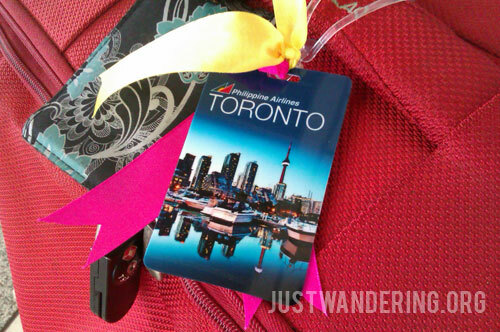 Cute bag tag, specially made for the trip! We were sent off by no less than PAL’s President, Ramon S. Ang. After a short ceremony, we were led into PAL’s latest Boeing 777-300 ER plane, which arrived in the country just three weeks prior. The mood inside the plane was festive, and you can sense the excitement of each passenger in the cabin. 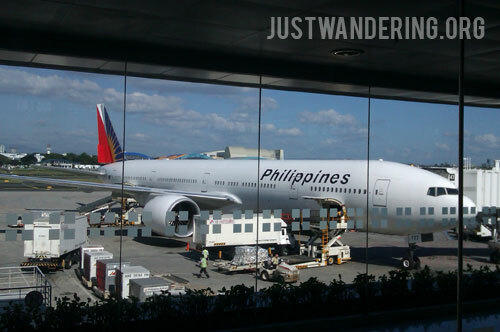 The new 777 can cover the 13,230 kilometer distance between Manila and Toronto without making any stops. The flight route takes you north, past Japan, crossing the International Date Line, and into Alaska and flying across Canada. This takes the Boeing plane about 15 hours. Personal AVOD, remote, and look, a USB and ethernet port! 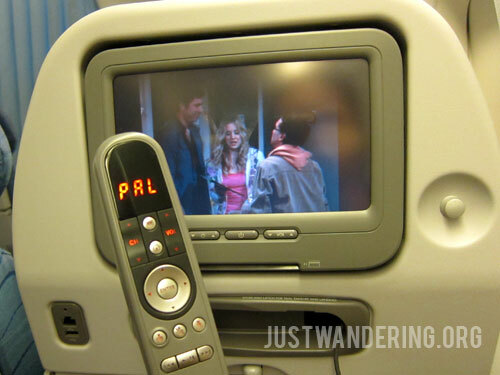 For such a long flight, the personal audio-video on demand (AVOD) feature is heaven-sent. Movies include some of the latest releases, several Hollywood classics and favorites, as well as a few Pinoy movies. 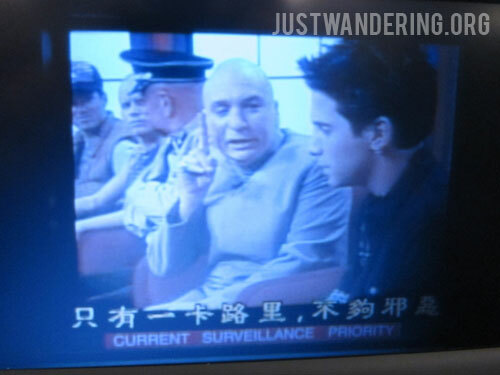 There are TV shows available (there were about five or so Glee episodes), and music of various genres. If that’s not enough to keep you occupied, there are also games to keep you awake. You are the Diet Coke of evil. Just one calorie, not evil enough. If you prefer your own in-flight entertainment in the form of tablets and iPods, here’s a bit of good news: the new Recaro seats are fitted with a USB port, so you can plug in your devices to charge it when the battery run low. The fresh spring rolls was goooooood. 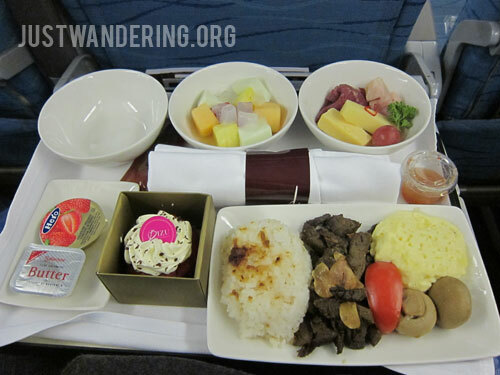 Since it was a maiden flight, a special menu was prepared, and we in economy enjoyed business class service. The selection was diverse, and it was hard to pick just one dish to have. The presentation of each dish was lovely, and the taste fantastic. Of course, life is fantastic when they serve you a cupcake with your breakfast. 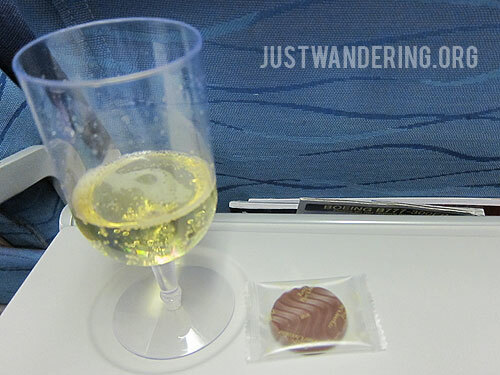 The service was efficient, as expected from flight attendants with years of experience. Flying can dehydrate you, and they are often seen walking up and down the aisles, offering water to parched passengers. After a couple of cat naps, two meals, one snack, three movies, one episode of Big Bang Theory and countless rounds of Tong-its Extreme on my iPod, an announcement came that we are approaching Toronto. We toasted to PAL’s return to Toronto after 16 years the East Coast after more than 10 years (geez, reading comprehension fail! ), and then buckled our seat belts and put our seats in the upright position. We landed smoothly on the runway, and one can’t help but put their hands together to applaud the pilot and Philippine Airlines for this new milestone. 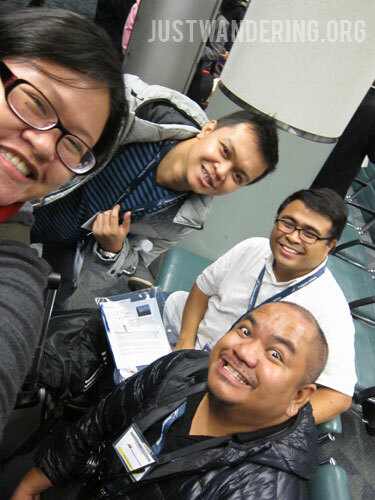 Though the flight ended when we disembarked, that was just the start of our adventures in Canada. Philippine Airlines has a brand spanking new (and pretty) site, where you can book your flight, check-in, or check flight status. Visit them at philippineairlines.com. To stay updated on their latest promos and announcements, follow them on Facebook and Twitter. You mentioned that PAL stopped its roundtrip flights 16 years ago. Do you know why? I always thought that roundtrip flights were always offered via PAL to Toronto, so it’s surprising to hear that they just resumed service after such a long break. In a way, I think it’s awesome that they brought it back. In fact, I just told my cousin out there that they’re flying non-stop from her city back to Manila & she’s excited, since she hasn’t been back to the Philippines from Toronto in awhile. Now that they have non-stop service, it makes it much more convenient (& cheaper, I assume) for everyone to fly. Also, did you fly business class or coach on the ride? How’s the leg room & comfort? She flew in coach or economy class as stated in the article. 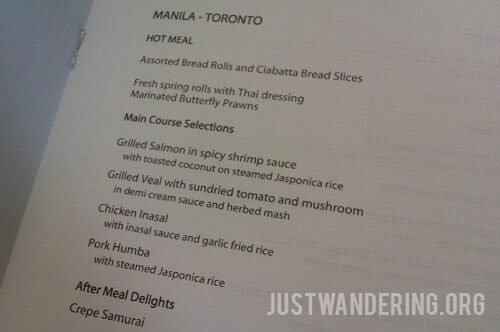 Unfortunately, PAL doesn’t fly non-stop from Toronto to Manila. They make a stopover in Vancouver on their way back. In my recollection, this is the first time PAL is flying direct to Eastern Canada. In Canada, they have a Vancouver-Manila route since, I think 1996. Read their PR here: http://www1.philippineairlines.com/news-and-events/pal-flies-non-stop-toronto-november-30/ and I don’t think they will be cheaper than the other airlines flying passengers to the Philippines from Toronto. Nina, you back in Manila? We didn’t have the chance to exchanges notes. You and the guys dissappeared at the party, eh? Oh, well. Maybe next time. Hope you enjoyed TO. Hey Noli, sorry we were in a hurry to make it to the Christmas Market before it closed. Coach on the way over (but with Business class service! ), and business class on the way back. This is good news since we have a lot of relatives there in Canada. Still I’m praying for the Philippines’ Category 1 safety standards upgrade from FAA so they can fly all the way to New York na.